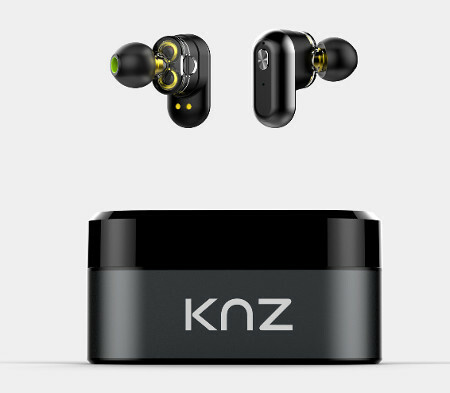 KNZ Technology, an audio tech company that is based in Atlanta, has recently introduced their latest addition: the SoundFlux wireless stereo headphones. Touted to be the first pair of dual-dynamic driver true wireless stereo headphones in the world, this Indiegogo project has managed to surpass its original goal many times over in a matter of just three weeks, which goes to show the kind of demand such a product has in the audiophile market. It is said that this is the very first time that a dual driver audio system has been integrated into a pair of truly wireless headphones. Via the SoundFlux’s dual driver system, one of the drivers will offer high and mid ranges, while the other is specifically meant for bass only. This dual driver system offers treble in details without any kind of distortion, while ensuring that your ears will be able to enjoy full, rich bass simultaneously. Delivering quality audio is one thing, looking good is another. With that in mind, the SoundFlux is also a beauty to behold with its fair share of cutting edge technology. Boasting of the IPX6 waterproof rating, you will be able to go out on your daily runs even though it is drizzling outside, and neither do you need to worry should a glass of water be spilled on it accidentally, thanks to the enhanced waterproof nano-coating. It also comes with dual-mic noise cancelling technology that supports crystal clear stereo phone calls, while those who are always in the need for control will find that the SoundFlux’s fully functional controls offer the ability to control both music and phone calls from the headphones, as well as make adjustments to the EQ settings directly. Powered by Bluetooth 5.0 Low Energy (BLE) technology, one can obtain up to 24 hours of listening time before requiring a recharge, while 5 minutes of charging can offer the SoundFlux enough juice to deliver an hour of battery life. The asking price of $119 is certainly well worth every penny in our opinion.